It is a common belief that here in Spain we go nuts about bullfights, flamenco and spend a lot of time enjoying our siesta, nothing more far from reality. As you saw yesterday in my previous post Las Arenas...we have less bullrings (I have never been to a Plaza de Toros in my life), flamenco is being blended with pop, rock, salsa or even jazz and of course we don´t have time for siesta anymore, hummm, that, I do miss. 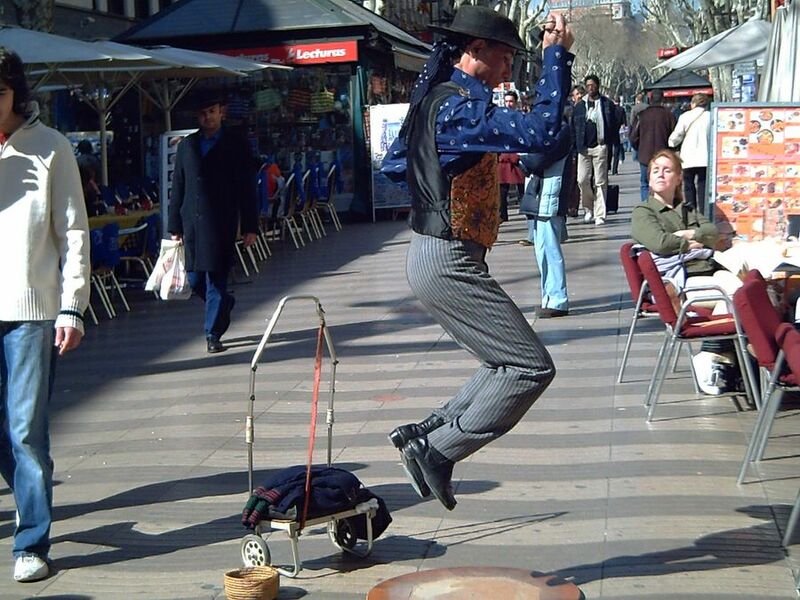 This bailaor of flamenco (flamenco dancer) was performing near the end of Las Ramblas, suddenly he jumps, I shoot and notice on my screen that his legs were not even blurred in the picture. You have to admit that good dancers sometimes flow in the air. Well I think that's an outrage! There should be a complaint to the E.U. that siestas have gone the way of the 2hour lunch in France...non-existing. Maybe people should do more flameco so that they are so tired they HAVE to take a siesta. Or go the French way and go on strike for more siestas! LOL. You bet, a good strike would really do. Thanks for posting, Eric. Well I said no siesta but fiestas (parties) we have a lot! Ha,ha, yes I'm not in Spain, you caught me on that. I didn´t mean to destroy your illusions I just wanted to mention the cliches. Barcelona is great, if you come you won´t regret it! Thanks for this comment, midnitebara. I like the expression of the woman in the back too. And thanks for adding me!